This wedding cake was inspired by this beautiful Vera Wang wedding dress. 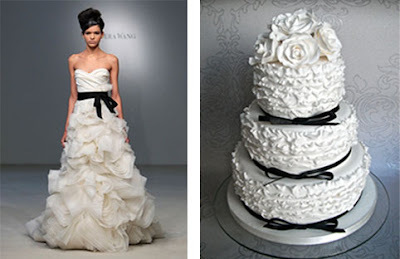 The cake has three tiers of white ruffles with black ribbon bows and is topped with white sugar roses. That cake is AMAZING! Love love love it! I love cakes inspired by fashion! I just can't get enough of your ruffle cakes! They are so beautiful.